The story of an Irishman’s personal passion to uncover the true causes of the high suicide rate in Japan. The disturbing findings include the Japanese media`s perverse love affair with suicide, a variety of cruel and predatory economic pressures and an outdated and failing mental health care system. 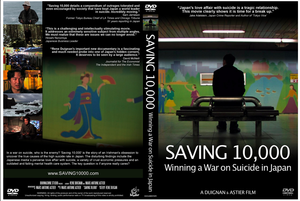 Saving 10,000: Winning A War on Suicide. Ireland has a severe problem with suicide. Not just from the economy but our unwillingness to address such a painful issue. Thankfully I dare say we are not as bad as Japan. This is is a gripping documentary by an Irish filmmaker [Rene Duignan] on Japan’s suicide and mental health issues. Please share and watch this video, I think new perspective on any problems we face is a healthy way of learning. Posted in Misc and tagged suicide at 11:14 am on April 12, 2013 by Broadsheet.